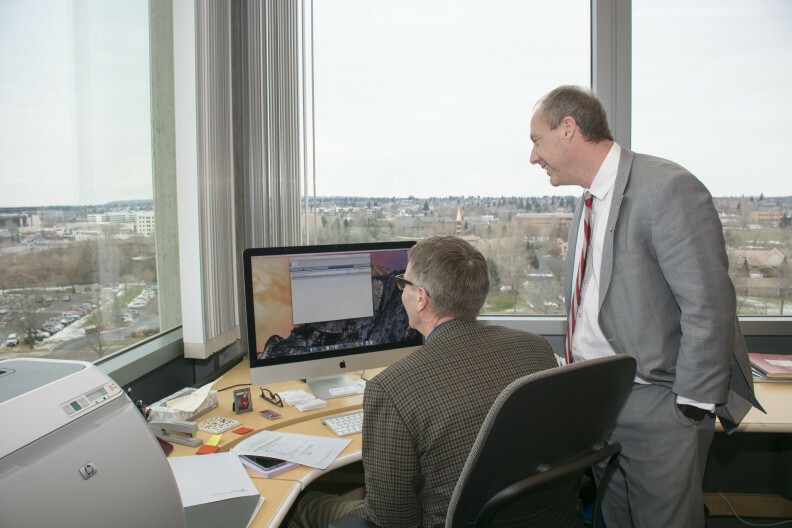 The WSU College of Medicine took another step toward opening a Washington State University medical school in Spokane today, with a simple click of the “submit” button. But “simple” doesn’t accurately explain the lead-up to today’s submission of the medical school accreditation application with the Liaison Committee on Medical Education (LCME), depicted in all of its electronic glory in the photo above (the official submission meant sending hundreds of pages of documents electronically to the LCME). Getting to this point was a lot of work, including hiring a dean and holding “self-study” sessions in Spokane, the Tri-Cities, Vancouver and Everett (not to mention getting approval from the legislature to start a medical school). Other faculty and staff members have been hired, and other items required for the application have been checked off our list and included in those hundreds of pages of documents. We’ve also developed partnerships across the state with hospitals and clinics, including Kadlec Regional Medical Center in the Tri-Cities. Those within the WSU system statewide – like Bob Drewel at WSU North Puget Sound in Everett – have voiced their excitement for how the WSU medical school will transform the university and the state. There are more steps to take, but the step taken today is an important one.